Saturday January 12th 1895 The storm had abated somewhat today I was busy with cleaning up the house and doing baking till after three in the afternoon. Will took the [illegible] till after dinner and got what we needed. I was very tired I read the papers in the evening. My plants froze last night. We took them in the cellar. Sunday January 13th 1895 It was rather a pleasant winter day, bright and cold. I got my work done in good time. Willie Anderson and wife with Mr Price and Mary Anderson were here for dinner. We had a pleasant visit with them I got my dishes washed after they went and a little supper for ourselves. I wrote in the evening. 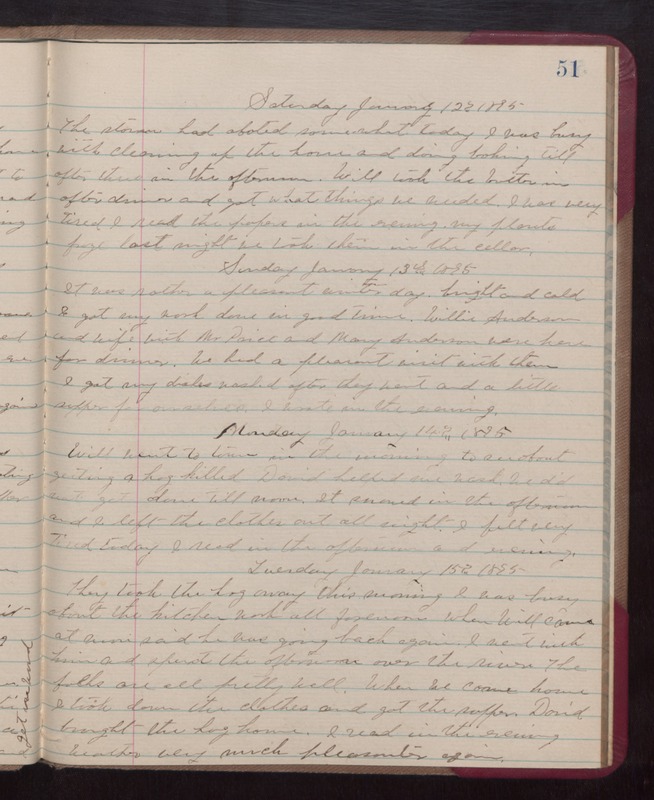 Monday January 14th 1895 Will went to town in the morning to see about getting a hog killed. David helped me wash. We did not get done till noon. It snowed in the afternoon and I left the clothes out all night. I felt very tired today. I read in the afternoon and evening. Tuesday January 15th 1895 They took the hog away this morning. I was busy about the kitchen work all forenoon when Will came at [illegible] said he was going back agian. I went with him and spent the afternoon over the river. The folks are all pretty well. When we came home I took down the clothes and got the supper. David brought thre hog home. I read in the evening weather very much pleasant again.